Monthly Site Traffic Update: February 2019 visits, 70,776; page views, 101,970 (Source: Ezoic.com). Take advantage of our traffic to grow your business. Email Josh at josh@sauconsource.com or call 610-442-3370 to get started! Hello! Thank you for your interest in advertising on SauconSource.com, your source for Saucon Valley news and information. An independently-owned and operated digital media company, Saucon Source LLC was founded by publisher and veteran local journalist Josh Popichak in 2014. The website, launched in October of that year, is updated daily with the most free news content for Saucon Valley and nearby areas. Instead of relying on paywalls, SauconSource.com is entirely supported by advertisers and social media management clients. Please take a few minutes to review the rate card below, explore the site and check out the ads on it. We believe that if you love reading Saucon Source you’ll also love advertising on it. Please read on to learn more about how we can help your business grow, and why we offer local businesses the best overall value when it comes to spending their hard-earned advertising dollars. Why advertise on Saucon Source? Community: We’re a small business that’s proud to support our community. Our readers trust us as their source for local information, including advertising, which is why we deliver results no one else does. Reach: SauconSource.com stories and posts received more than 1 million pageviews in 2018. The site receives on average roughly 60,000 to 80,000 visits per month (more than 70,000 in February 2019). Frequency: The site is updated daily with Saucon Valley news. We’re often the first media outlet to break local news. Innovation: We offer innovative, mobile-friendly advertising that is affordable and results-driven. Flexibility: Since SauconSource.com publishes online, 24/7/365, there are never any deadlines, and changing your ad is as easy as telling us what you want and how you want it to appear. Turnaround times for advertising are typically much faster than with print/TV/radio ads, which also require you to meet their deadlines. At Saucon Source we do what works for you. Content: We offer sponsored content. When you advertise for a month or longer you receive at least one complimentary sponsored story, which you can use to remind people about who you are and/or highlight news about your business, such as an anniversary, a new product/service or a new staff member. From a marketing perspective sponsored stories work differently. They’re promotional but also valued by readers for their usefulness. Influence: At Saucon Source we’re more than just a news outlet; we’re also social media influencers. Our local influence is extensive on social media, where Saucon Source currently has more than 9,200 Facebook and 2,300 Instagram followers. Others get our news via Twitter and LinkedIn. Our email newsletter has more than 1,700 subscribers and a reader base that’s rapidly growing. Growth: Features that will launch in the future will help further grow our readership. One new site development that is coming soon is an optional membership platform called MySauconSource. MySauconSource will reward readers who support us with modest monthly contributions with access to exclusive features such as breaking news text alerts, a monthly local deal and a members only Facebook group in which they’ll be the first to find out about local news and information. 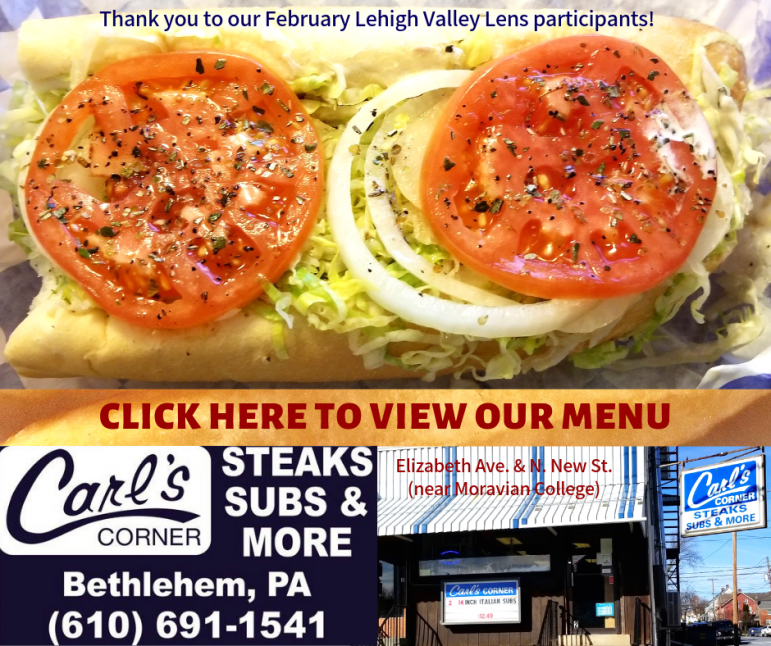 Our recently launched monthly photo contest, called Lehigh Valley Lens, is also attracting new readers to Saucon Source from throughout the Lehigh Valley. For more information about SauconSource.com advertising opportunities, including pricing, please contact Josh Popichak at 610-442-3370, at josh@sauconsource.com or via Facebook. How does advertising on Saucon Source work? Saucon Source offers two different zones for display advertisers: the title zone and the content (or regular) zone, and dozens of types of ads through our hosting provider Broadstreet ads. Need to reach a lot of people in a hurry, with a message they can’t miss? 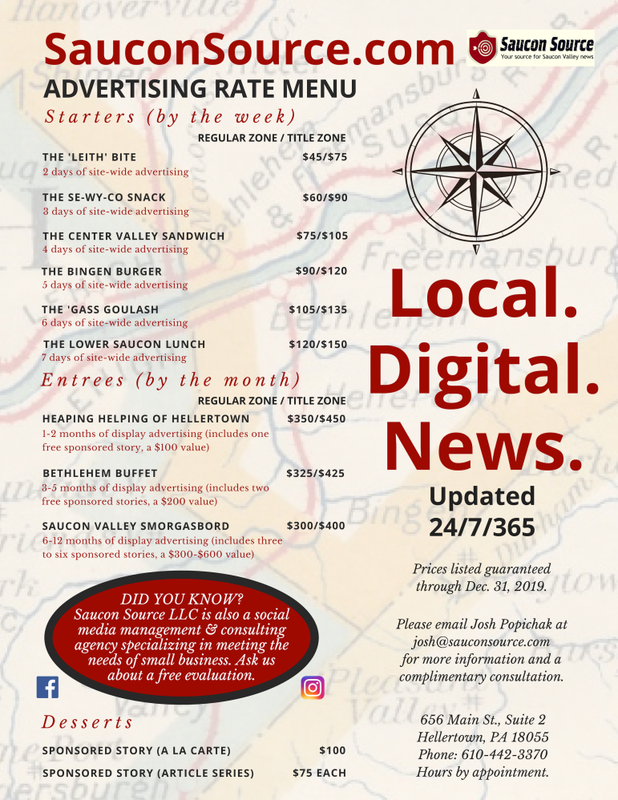 The title ad zone is the premier and most prominent advertising space on the Saucon Source website (example specs: 450 pixels wide by 150 pixels high). Several ads may run in rotation in this zone at a time. Your business or organization’s ad will attain higher visibility when running in this zone, which is prominent on page loads on both mobile devices and desktops. An example of a title zone ad. Need a larger ad that offers more flexibility? In that case our content zone ad (specs: 375 pixels wide with variable height) is a perfect choice. Square or rectangular ads in this zone can display more text and more graphics, and appear above and below stories, as well as alongside them when viewing the site on a desktop. An example of a content/regular zone ad. Choose from a wide variety of ad types–including flash-enabled, photo gallery, social media-integrated and more–available via our partnership with Broadstreet Ads. Below are several examples of them. Please click here to see more of the types of ad from which you may choose. Need an updated professional photo for use with your ad? We can take one for you and include it in your package price. How many people will my ad reach? Your ad’s reach will vary and depends on several factors, including the zone you choose to run it in and most importantly the amount of traffic on the site while it is running. Typically any ad that runs for a week or more will receive upwards of 10,000 impressions and 20 or more clicks. The total number of impressions served (the number of times ads were viewed) in May 2018 was over 500,000 (source: Broadstreet Ads). What do I receive with my ad? Ad design is free and included in the price of your ad, but we’re also happy to work with you if you’d like to design your own ad to meet our specs. Your ad is linked to a webpage (such as your homepage or social media page) of your choice. Included in the price of your purchase is a complimentary post about your business on the Saucon Source Facebook page, which has more than 9,200 followers. Your ad will also appear in the Saucon Source e-newsletter, which you can subscribe to here. Also included with your purchase of an ad run of a month or longer is at least one complimentary sponsored story (value: $100). Use your sponsored story to remind readers about what makes your business special, to highlight an upcoming special event, to celebrate an anniversary or honor you’ve received, or for something else. The choice is yours. Our staff will work with you to make sure you’re happy with every aspect of your story, from the photos that accompany it to how it is showcased in social media shares. Note: Sponsored stories may also be purchased separately. Click here for an example of a sponsored story. Also available on a limited, seasonal basis are sponsored article series. A sponsored series is paid for by a local business or organization, whose name is highlighted in the headline and in a blurb at the end of the story. Typically, Saucon Source offers sponsored series opportunities to help subsidize our expanding coverage of seasonal high school sports. These sponsorships include display advertising and typically require a commitment to sponsor at least 10 articles. Please email publisher Josh Popichak at josh@sauconsource.com for pricing and more information. All sponsored stories–regardless of type–are featured at the top of the homepage when published and are shared on Facebook, with your business tagged. They’re also featured in the Saucon Source newsletter, which is emailed to more than 1,750 subscribers each Monday, Wednesday and Friday morning. Typically a story is on the homepage for up to a week, after which it’s archived and still accessible to readers via search. Links to sponsored stories appear in search engine results, which is an added value. Saucon Source understands that local nonprofit organizations often have very limited advertising budgets, which is why we offer nonprofits a 50 percent discount on display advertising and a 20 percent discount on sponsored content. Please note that no further discounts may be applied. All local nonprofits are invited to use our community events calendar to help promote their upcoming events, free of charge. Simply create a new account or log in to an existing one to post your event here. As a small business with local roots, our commitment is to our community. We’re invested here too, and we owe our existence to the other small businesses that help make Saucon Valley such a special place. That’s why we will be invested in your business’s success. Thank you for considering advertising with us. We look forward to talking with you soon. For more information about advertising please email Saucon Source publisher Josh Popichak at josh@sauconsource.com or submit your contact details via the form below (please put “Ad” in the subject line).